Herr Louis Dobermann was a German tax collector who needed an alert, companion dog to protect him when he was doing his rounds. Because he was also the keeper of the local animal shelter, he had a continuous supply of breeding stock to help him develop just such an animal. This "put together" breed was subsequently named after him, as a tribute to his creation. 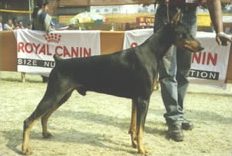 Apart from being unequalled as a guard and watchdog, the aristrocratic-looking Dobermann has also been used with great success as a police and war dog. An elegant animal with a very proud carriage, he is energetic, determined, fearless, loyal and obedient. An honest dog, uncamouflaged by superfluous coat or barbering (as with so many other breeds) his qualities shine forth for all to see. With the Dobermann, what you see is truly what you get! One of his most endearing qualities is his steadfast devotion to hearth and home, serving as friend and guardian of the whole family. This noble dog thrives on his role as family policeman which he plays to perfection and should be supervised with visiting children. Obedience training and socialisation of this breed should begin at an early age. The Dobermann enjoys as much exercise as you can give him, but requires little in the way of grooming. His sleek glossy coat may be black, brown, blue or fawn with rust red markings.